Project Mills Phase II - SURE STEEL, INC. The Mills Phase II Warehouse & Office, located in Sparks, NV, is evidence of Sure Steel, Inc.’s commitment and dedication to a successful project. The 88,344 SqFt data center, which consists of 3 separate but connected structures, was completed in a short 58 days, despite large scalefield changes to scope and an original ‘erect-only’ contracted schedule of just 68 days. 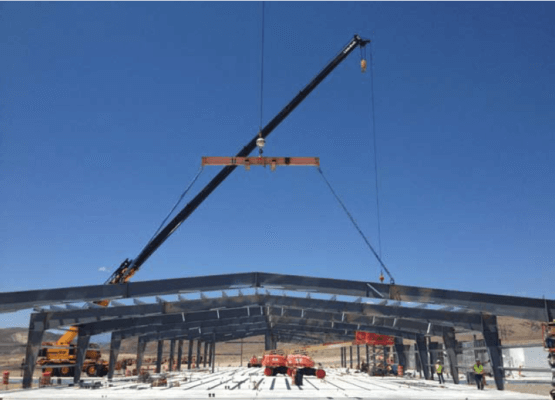 Using strategic manpower coordination and practical solutions, Sure Steel, Inc.’s project team decided to simultaneously utilize 5-6 separate crews and run 3 cranes in order to meet the tight schedule implemented by the GC. The 681 tons of steel and 643,000 SqFt of panels were erected without any safety incidences, making it another safe Sure Steel, Inc. project.